Franklin Foer on learning from the Leon Wieseltier sexual harassment allegations. Former New Republic editor Franklin Foer on processing and learning from the Leon Wieselter sexual harassment allegations. 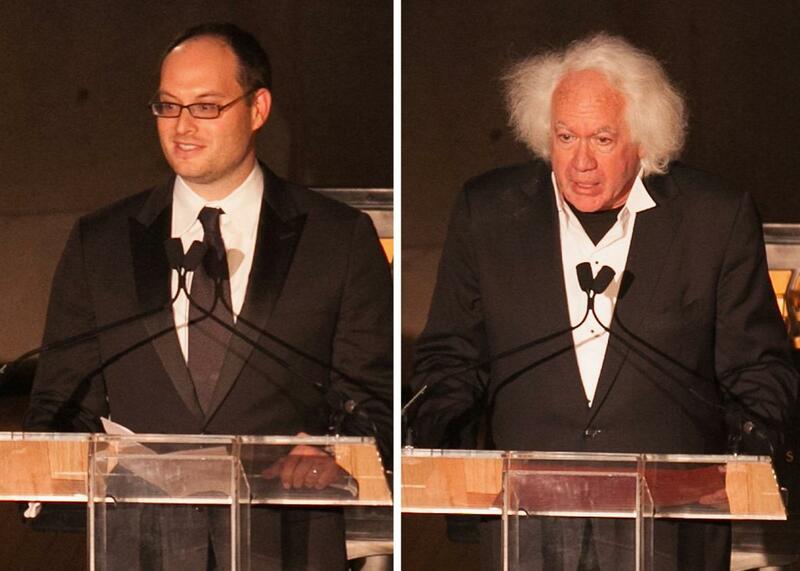 Franklin Foer, left, and Leon Wieseltier. Last week, longtime New Republic editor and writer Leon Wieseltier admitted to “offenses against some of my colleagues in the past” after several women stepped forward with sexual harassment allegations. On this week’s DoubleX Gabfest, Noreen Malone, Hanna Rosin, and June Thomas speak with former New Republic editor Franklin Foer about the Wieseltier allegations and what he’s learned since. Rosin worked at the New Republic for several years in the 1990s, and Malone worked there from 2013–14 under Foer. This transcript has been edited and condensed for clarity. Hanna Rosin: When the news broke about Leon, what was going through your head and your heart? Were you shocked? Were you feeling guilty? What were the various things that came to you in that moment? Franklin Foer: I got wind that there was a group that had formed after the Harvey Weinstein revelations that had begun to discuss Leon and women’s history with Leon. And I learned that there had been stories that had emerged that people were talking about in the open for the first time that were incredibly bruising and that were startling. Rosin: This is a point that Michelle Cottle made in her story. She started by making fun of the term open secret, which is a funny term. I know that you meant “in the open,” meaning it wasn’t in the open when the group was discussing it; it was more among themselves. But by “in the open,” you mean, “in the press.” Because one interesting thing about Leon is that everybody kind of knew. It wasn’t even really a secret. We all talked about it. The women always kind of talked about it. Foer: I guess what I mean by in the open was that it—by moving into that discussion group, it was beyond just something people whispered to each other. Those conversations before happened, for sure. Even if this chatroom was kind of behind closed doors, I think it was less behind-closed-doors than all the discussions over the decades. Noreen Malone: This was purposeful, it seemed. I think maybe that’s what you’re getting at. Rosin: Yeah, this was purposeful. Like a lot of things that have happened this week, it seems like a moment when, in one form or another, women band together, feel more empowered, share stories. Rosin: Do you feel like the men talked about that among themselves, or was that just listening to the women talk? Foer: At what point? Do you mean over the years or … ? Foer: Over the years, I don’t think that they did. I think there was a high degree of obliviousness to it. It’s so hard to know what’s willed denial. Malone: I just don’t think that’s true, at least not when I was there. I think that a lot of the men on staff knew. I remember jokes about it. I actually searched my Gchat and found jokes about Leon’s behavior. I wasn’t in the D.C. office, I wasn’t observing it on a daily basis, but it’s a crowd of highly observational people. It seems insane to me that all of these men would not notice something that was happening under their eyes and in some ways, for their benefit, in a weird kind of power-lording way. Rosin: What do you mean about “for their benefit,” Noreen? Malone: Well, it seems that if you’re sexually harassing people in the open, there are a couple kinds of sexually harassing behavior, and one is in secret, and that’s its own psychology. But this was just public displays of skeeviness, which seemed to me to be just as much about showing other men that you have a kind of power in the office that they don’t have. That you are untouchable. That you’re the king. That’s my read on the situation: The office dynamics are complicated. Foer: Did you witness something? What was your firsthand experience? Malone: No, I didn’t witness directly anything that I would directly describe as sexual harassment, but I heard stories from other women and from men who worked at the D.C. office. But there was an air at the New Republic of “Well, that’s Leon.” The byzantine power structures of the New Republic were such that “Leon’s survived every editor. Leon picks the editors. This is just what happens.” There was almost an air of shtick about it by the time I was there. Rosin: It was exactly the same when I was there. One of the things I’m kind of grateful for is that women your age and younger just have such clear lines around what is harassment and what’s acceptable. I feel like the women my age who were there really felt like, “Well, that’s just the system.” It never occurred to us that there was any other way to be. There’s the sun and the sky and the moon, and that’s just how it is, and you just have to deal. I was just so grateful that people younger have a totally different view, even if it is complicated, because it is complicated. And Michelle Cottle described it in all its complexities, and any woman who worked there could describe it in even more complexities. There’s still a kind of bright line, like, “We call this out. This is not cool in a workplace.” For that I am grateful: We didn’t even think about it like that at all. Foer: From my perspective, to say that I didn’t know about harassment—I think I need to make a distinction that was maybe important to me then, but as I’ve absorbed the story and talked to women who worked at the New Republic, I think there was part of it that was out in the open that was culturally accepted and that was accepted when I arrived and I never questioned, which was that there was an element of off-color joking, which was what he did about everything that was accepted. Over the years, there was comments objectifying women or talking about appearance. I felt like there were, to my shame, a handful of times where I heard him talking about women in the office where I didn’t object or didn’t complain, and I just kind of buried that in my head or didn’t really think through the implications or challenge it. So that part is real. There’s part of Michelle’s piece that I was oblivious to or didn’t grasp or maybe buried my head in the sand, which was the predatory nature of it all as it relates to younger women and the Sarah Wildman incident and all these examples that added up in that piece. That’s the part that I feel like I totally missed, and I understand that there’s a connection between these two things. June Thomas: Frankie, when you were in the room and Leon made one of these comments, you just didn’t say anything? Did you join in? Did other men join in? You said you didn’t intervene. Why didn’t you, and what was your role in all of this? Foer: When I heard a comment like that, I think my response was probably shame or extreme discomfort, wanting to hide, changing the subject pretty quickly. To be clear, it wasn’t like I heard these types of comments every day, every month. It was things that would be scattered over the course of many hours, many months of conversation. Malone: I think part of the romance of working at a place like the New Republic or other magazines where I’ve been talking to people is that you can screw around and talk about ideas and it’s a small office, and it’s not a corporate atmosphere, right? And part of the fun of it is that you do get to drink with your co-workers and talk about ideas. And that was all wrapped up in that, and I think the Leon mystique very much had something to do with that. But when I saw the men of TNR tweeting their surprise, I guess my feeling was that their surprise must be at how it made people feel rather more than that it happened. That women would have taken some of these incidents and taken them to heart in really deep ways. And I think that had more to do with—and this really clicked into place with the Leon thing, some of my own frustrations with the New Republic—the larger atmosphere with it being a boy’s club. I think that it might not have hit people quite as hard had they felt like they had actual opportunity at the New Republic, had they felt that they weren’t closed out of opportunity or just not given certain reporting assignments because of their gender, had some structural things been in place for women to succeed at the New Republic. I think that is part of what made it so frustrating for people was that it wasn’t a climate where women were treated the same. Foer: I think I agree with you. I definitely think that the informality of it is part of what gave it its mystique, and it’s also part of what makes something like this so difficult, where it doesn’t feel like there are necessarily rules or institutional structures. Malone: Why wasn’t there an HR department at TNR? Foer: There was this sense that it was too poor to afford one. And I think that by the time Chris Hughes came in, there was a de facto HR department or there were people who handled HR. I do think in the way in which the last couple weeks have been this—they disrupt the system. They’ve caused me to think about so much afresh and rewind the tape and rethink certain assumptions and to have pretty tough conversations with my friends and former colleagues. I do think there is a way that what you’re describing as a boys club culture, a way in which women sometimes felt unseen or treated as inferior members of the intellectual community—I think that that is, for me, the toughest part to hear. To me, it’s the most rattling observation of it all. Rosin: But do you feel like you perpetuated it in any way? Foer: I don’t, no. I’d be curious to hear Noreen’s thoughts on this, but from where I sit, I went and I tried to hire women in to create greater gender balance in the staff. I tried to give women, for instance, a VIDA byline count where we tried to get closer to gender balance with our bylines. Malone: Yeah, and that’s great. I do think, on some level, there are larger structural forces that do often drag down these efforts. There were a lot of women hired. They were lower on the totem pole. They weren’t in the rooms where decisions were being made. There was one senior female editor, unless I’m misremembering. There were certain structures that were part of the institution, like the editorial board meetings, that for whatever reason favored a certain type of male argumentation. There was a bias against culture writers. There was an unwillingness to try women on politics in exactly the same way. I think there were little things that had to do with the history of the magazine that made it very complicated. The New Republic is a unique institution but also in some ways par for the course. Everywhere I’ve worked has had this problem to a greater or lesser degree, but I will say that the New Republic is where it felt most acute, and part of that is because the historical legacy was so present. Malone: Yeah, you’re being a good sport, Frank. Thomas: What will you do differently next time you’re an editor? Or does the fact that you didn’t see this massive pattern of discrimination against the women who worked with you or for you disqualify you from being an editor? How can you be a good reporter if you didn’t even notice that this massive pattern of sexual harassment was going on in the office that you worked in? Again, I’m being very personal to you, but you are the stand-in now for men in this profession. This is a profession that’s supposed to be about observation, and yet apparently, a good number of the people working in it were completely unable to observe this massive pattern that was absolutely surrounding them. Foer: I have really no desire to go back into management ever again. But the sense that Noreen got at in her last comment was this sense that men—the culture of journalism, the culture of intelligencia—having grappled with that: Why are VIDA counts off? It’s cultural, it’s historical, but aren’t there ideas about female intelligence that are embodied in a lot of that engrained bias and in this notion that men have had such difficulty kind of comprehending the culture of their institutions or the damage that they’ve done to women. All I can say is once you see that and your view of the world has been transformed, all I can do is try to be more curious and open and engaged and try to do better for myself, which is, at least now, the one thing I can control since I don’t run anything. Rosin: I think a lot of people are feeling radicalized, partly because of what Frank said. I myself look back at those years and think, “Why was that the structure that I lived in? Why did I think it was OK? Why did I think it would never change?” … It is kind of the seeing-clearly moment, even if the seeing clearly pisses you off. Malone: I think that’s an important thing in this moment, that there are a lot of men who are truly shocked. On some level, I’m mad, like, “Why didn’t you seen this before?” But it wasn’t your life. This separate thing doesn’t necessarily connect to this separate thing, and it didn’t even for me in some ways until watching all the power structures that supported all of this come crashing down. And I think that actually having men just think it through is a good thing for society going forward. Rosin: As soon as one’s outed, it’s like half a day before the institution does not support them in the way that they did, so that’s all good. Thomas: There are structural challenges that apply in journalism, but also in any place where you are rewarded for being a little bit special, for thinking a little bit differently, for expressing your ideas a little bit differently. That can lead to certain people being exempted from the rules. I never met Leon, and from what I have heard about him, I never wanted to, but clearly, even people who have had horrible experiences with him also talk about his charm and his brilliance. That is a tricky contradiction, and they’re maybe not behaving quite like he has behaved. But whenever there are people whose success is based on their seeing things differently, we tend to treat them differently, and that can be so problematic. We want those people, and we want to reward them, and we want them to do well and do well for us, but you just can’t let people have different rules applying to them. We just can’t keep doing that. Rosin: The other complication in which rules apply differently is that, at least in my day, unlike the other men who were at the top of the New Republic, he was interested in women, and I don’t just mean sexually. He was interested. He mentored, not all of them, but some small number. He was interested in women, he was interested in culture, he was interested in a lot of the things women were interested in and in nurturing women’s careers. That’s an extra complication to this whole thing. Frank, you have been a sport. Thank you for coming on the show.